Currency and shipping options will change to reflect those available in the selected region. Pricing and discounts will be adjusted according to the shipping destination based on regional availability. Exclusive web offer for individuals on print books only. Terms & Conditions may apply. 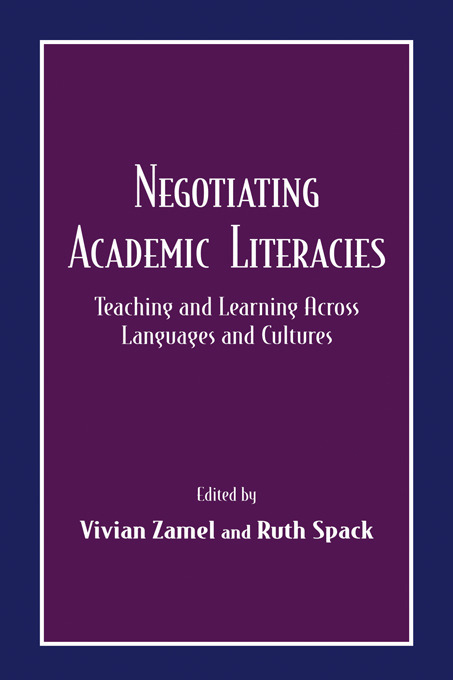 Negotiating Academic Literacies: Teaching and Learning Across Languages and Cultures is a cross-over volume in the literature between first and second language/literacy. This anthology of articles brings together different voices from a range of publications and fields and unites them in pursuit of an understanding of how academic ways of knowing are acquired. The editors preface the collection of readings with a conceptual framework that reconsiders the current debate about the nature of academic literacies. In this volume, the term academic literacies denotes multiple approaches to knowledge, including reading and writing critically. College classrooms have become sites where a number of languages and cultures intersect. This is the case not only for students who are in the process of acquiring English, but for all learners who find themselves in an academic situation that exposes them to a new set of expectations. This book is a contribution to the effort to discover ways of supporting learning across languages and cultures--and to transform views about what it means to teach and learn, to read and write, and to think and know. Unique to this volume is the inclusion of the perspectives of writers as well as those of teachers and researchers. Furthermore, the contributors reveal their own struggles and accomplishments as they themselves have attempted to negotiate academic literacies. The chronological ordering of articles provides a historical perspective, demonstrating ways in which issues related to teaching and learning across cultures have been addressed over time. The readings have consistency in terms of quality, depth, and passion; they raise important philosophical questions even as they consider practical classroom applications. The editors provide a series of questions that enable the reader to engage in a generative and exciting process of reflection and inquiry. This book is both a reference for teachers who work or plan to work with diverse learners, and a text for graduate-level courses, primarily in bilingual and ESL studies, composition studies, English education, and literacy studies. "…Zamel and Spack have selected authors well. All of the pieces are worth reading, and many of them are certain to invite lively discussion about academics and their words." "[I] recommend this book, particularly to new teachers in the field of ESL writing, who may have yet to grasp the magnitude of their task. However, even for seasoned teachers and researchers already familiar with the arguments as summarized so far, Zamel and Spack's volume offers something engaging and challenging." "Spack explores the crucial role teachers play in managing the conflicting identities in the classroom and suggests a dialogue on what has been ignored. A treasure for teacher educators and new writing teachers to have in a single volume." "Although ESL is closely related to composition, education, linguistics, anthropology, and other fields, the work of ESL scholars is too seldom seen in the publications of these fields, and vice versa. The appearance of Zamel and Spack's edited collection of influential, thought-provoking readings on academic literacy from ESL as well as from these other areas is therefore welcome indeed. Perusing this collection of previously published articles allows one to see the multitude of connections among the fields represented." "This collection provides an effective introduction to some of the important figures in the field of discourse and second language for people who teach literacy to students of diverse backgrounds and who train teachers. These essays provide a historical perspective of the study of academic literacy. Finally, a teaching tool and useful reference, this book is also important as an addition to the limited number of books which explore topics related to second language writing and linguistic diversity." Contents: Preface. M. Shaughnessy, Diving In: An Introduction to Basic Writing. M. Rose, The Language of Exclusion: Writing Instruction at the University. M. Cliff, A Journey Into Speech. E. Kutz, Between Students' Language and Academic Discourse: Interlanguage as Middle Ground. J.P. Gee, What Is Literacy? B. Mellix, From Outside, In. M-Z. Lu, From Silence to Words: Writing as Struggle. R. Spack, Initiating ESL Students Into the Academic Discourse Community: How Far Should We Go? K. Spellmeyer, A Common Ground: The Essay in the Academy. F. Shen, The Classroom and the Wider Culture: Identity as a Key to Learning English Composition. R.E. Land, Jr., C. Whitley, Evaluating Second Language Essays in Regular Composition Classes: Toward a Pluralistic U.S. Rhetoric. P. Elbow, Reflections on Academic Discourse: How It Relates to Freshmen and Colleagues. M.L. Pratt, Arts of the Contact Zones. V. Zamel, Questioning Academic Discourse. P.N. Limerick, Dancing With Professors: The Trouble With Academic Prose. L.D. Delpit, The Politics of Teaching Literate Discourse. L.L. Blanton, Discourse, Artifacts, and the Ozarks: Understanding Academic Literacy. H.G. Widdowson, The Ownership of English. V. Zamel, Strangers in Academia: The Experiences of Faculty and ESL Students Across the Curriculum. A. Pennycook, Borrowing Others' Words: Text, Ownership, Memory, and Plagiarism. R. Spack, The (In)visibility of the Person(al) in Academe. N. González, Blurred Voices: Who Speaks for the Subaltern? Routledge eBooks are available through VitalSource. The free VitalSource Bookshelf® application allows you to access to your eBooks whenever and wherever you choose. An eBook version of this title already exists in your shopping cart. If you would like to replace it with a different purchasing option please remove the current eBook option from your cart. © 2019 Taylor & Francis Group, a business owned by Informa PLC, registered office is 5 Howick Place, London SW1P 1WG. Registered in England and Wales. Number 3099067.